Robert Rundo, the muscly leader of a California-based white-supremacist group that refers to itself as the “premier MMA (mixed martial arts) club of the Alt-Right,” unleashed a barrage of punches against his opponent. But Rundo, a 28-year-old Huntington Beach resident who would be charged and arrested in October over a series of violent attacks in his hometown, Berkeley, and San Bernardino in 2017, wasn’t fighting on American streets. It was April 27 and Rundo, whose Rise Above Movement (RAM) has been described by ProPublica as “explicitly violent,” was swinging gloved fists at a Ukrainian contender in the caged ring of a fight club associated with the far-right ultranationalist Azov group in Kyiv. A video of Rundo’s fight, which was streamed live on Facebook (below), shows that the American lost the bout. But for Rundo, who thanked his hosts with a shout of “Slava Ukrayini!” (Glory to Ukraine), it was a victory of another sort: RAM’s outreach tour, which included stops in Italy and Germany to celebrate Adolf Hitler’s birthday and spread its alt-right agenda, brought the two radical groups closer together. “We think globally,” Olena Semenyaka, the international secretary for Azov’s political wing, the National Corps, told RFE/RL in an interview at one of the group’s Kyiv offices last week. It was Azov’s Semenyaka who hosted Rundo along with fellow Americans Michael Miselis and Benjamin Daley, RAM members who participated in last year’s “Unite The Right” rally in Charlottesville, Virginia, that was the backdrop for the death of 32-year-old counterprotester Heather Heyer. Over the past year, she’s made several outreach trips to Western Europe to meet with far-right groups and spread Azov’s ultranationalist message. And when she’s not doing it herself, Semenyaka said, that task is sometimes given to Denis Nikitin, a prominent Russian soccer hooligan and MMA fighter who founded the white nationalist clothing label White Rex and has a garnered a large following across Europe and the United States. In November 2017, the two traveled together to Warsaw and participated in the Europe Of The Future 2 conference organized by Polish white supremacist group and “ally” Szturmowcy (Stormtroopers), where they were meant to speak alongside American Richard Spencer, Semenyaka said. But Polish authorities barred Spencer from entering the country and he was unable to attend. With Ukraine’s weak military at the time caught flat-footed, Azov and other such battalions did much of the heavy fighting in the early days of the war, which has killed more than 10,300 people. The Azov Battalion flaunts a symbol similar to that of the former Nazi Wolfsangel. (The group claims it is an amalgam of the letters N and I for “national idea.”) It has been accused by international human rights groups, such as the Office of the United Nations High Commissioner for Human Rights (OHCHR), of committing and allowing serious human rights abuses, including torture. 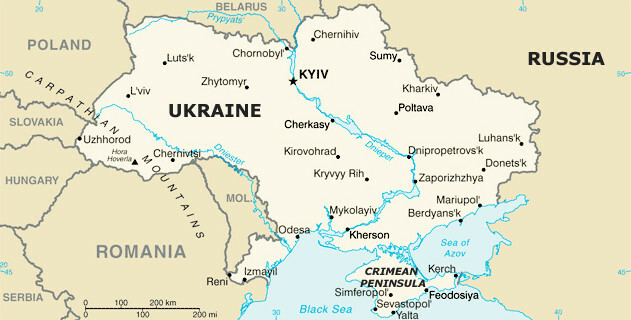 Following a 2015 deal known as the Minsk Accords that was meant to be a road map to end the fighting but did little more than turn down the intensity, the Azov Battalion was officially incorporated into Ukraine’s National Guard and its leadership shifted focus from the battlefield to the political arena. As RFE/RL reported at the time, the National Corps’ inaugural ceremony arguably had pomp more reminiscent of 1930s Germany than of postwar democracy. It included nationalist chants, raised fists, and a torchlit march through central Kyiv. In January, in another flashy ceremony, Azov introduced a new paramilitary force that it calls the National Militia. On a snowy evening, some 600 of mostly young men in matching fatigues marched from Kyiv’s central Independence Square to a lighted fortress on a hillside in the Ukrainian capital, where they swore an oath to clean the streets of illegal alcohol, drug traffickers, and illegal gambling establishments. While not officially part of the Ukrainian Interior Ministry or any other government body legally authorized to enforce the law, the National Militia has more often than not been allowed to establish what it considers “Ukrainian order” on the streets of cities across the country. In many cases, that has meant attacking LGBT events and Romany camps, actions for which members of the group have not been prosecuted. Combined, these groups are known as the “Azov movement,” which includes more than 10,000 active members, according to Semenyaka. But Azov’s success in growing the movement so far has not translated into much political success at home. Those groups didn’t fare much better in July, when GFK Ukraine asked whether voters would support an alliance of National Corps, Right Sector, and a third far-right party, Svoboda, and only 2 percent responded positively. Much of the success has come from recruiting new, mostly young, members, who it hopes will come to the polls in next year’s parliamentary elections. It has also utilized the reach of social media, particularly Facebook and Telegram, where the group recruits and promotes patriotism, nationalism, and a sport-focused lifestyle. Much of that effort caters to Ukrainians coming of age in a time of war and as illiberal governments rise on the country’s periphery, said Ukrainian sociologist Anya Hrytsenko, who researches far-right groups. Now, she said, the strategy is to “moderate” in order to appeal to a broader base in Ukraine and abroad. But only to an extent. “Their English has gotten better,” Hrytsenko said, referring to Azov members behind the group’s Western outreach. Another thing that has helped, Hrytsenko noted, is that Ukraine’s break from Russia and move toward the European Union has allowed Ukrainians visa-free travel, making Azov’s outreach easier logistically. Semenyaka participated in and blogged about the Young Europe Forum in Dresden in August alongside far-right sympathizers from groups in Germany, Italy, and Austria. Specifically, she said she has met with those from groups that Azov considers close allies — for instance, Greece’s Golden Dawn, Italy’s CasaPound, Poland’s Szturmowcy, and Germany’s National Democratic Party and Alternative For Germany. Besides speaking about their shared ideologies, Semenyaka said, Azov members in some cases have “shared experiences in creating territorial defense forces,” a reference to the groups battalion and vigilante street units. On the visit, the three Americans also attended a concert by the white-nationalist metal band Sokyra Peruna, where concertgoers made Nazi salutes and waved Nazi flags. They also posed for photographs to promote Rundo’s The Right Brand clothing line at Kyiv’s Independence Square, joined Azov members at Kyiv’s famous outdoor gym, Kachalka, for a weight-training session, and fought at the Reconquista Club. Rundo even got White Rex’s Viking warrior logo tattooed on his left calf. “But there was no military training,” Semenyaka insisted. Counter-Currents’ Johnson was perhaps the most recent American to ask for Azov’s help. In a rare public appearance, the alt-right ideologue visited Kyiv at the invitation of Semenyaka to lecture on October 16 about his Manifesto Of White Nationalism. Semenyaka translated for Johnson, who spoke to a small but crowded room at Azov’s Plomin (Flame) cultural center. In a video of the event published on Azov’s Plomin YouTube channel, Johnson, whom the Southern Poverty Law Center (SPLC) describes as “one of the leading voices of the far-right” and “an international figure for white nationalism,” doesn’t hide his motive for the trip: to learn from Ukraine’s ultranationalists and their successes. “This is not a speaking tour, it’s a listening tour. I really want to learn how maybe we can do things better in the United States and Western Europe,” Johnson said, lamenting the state of the alt-right in the United States. “It was a very, very influential and powerful movement for a very short time,” he said of America’s alt-right movement, without providing a precise time frame. “And at the peak of it, we had a network that extended all the way to the office of the president,” he continued, in what appeared to be a reference to Steve Bannon, the former White House chief strategist and alt-right figure. “There were very few degrees of separation between people who were making ideas…and people who were in a position to make political policy, and that was totally destroyed,” Johnson added. While Azov’s cooperation with groups like RAM has been largely welcomed by the group’s members, some have found it uncomfortable. “I don’t mind [Azov] reaching out, but the ones they reach out to… Jesus,” he told RFE/RL, in an allusion to RAM. He added that he had recently distanced himself from Azov because of that association and others with far-right groups in Europe. But Semenyaka described praise of Azov from foreign ultranationalist groups who are increasingly welcoming it as evidence that the organization is taking the right path. And she said it isn’t about to let up.